Balloons over Waikato Trust are thrilled to announce the fourth Special Shape flying at the Balloons over Waikato festival 22nd – 26th March… The Big Hug. This unique balloon is an elephant and a polar bear embracing. Carrying the message “Wake up and live in peace”. The Big Hug was designed and created by balloon builder Rodrigo Da Silva from Aeromagic Balloons in Sao Paulo, Brazil. Da Silva was inspired to design this balloon by what was happening around the world and his concerns around its many problems. Da Silva says, “Our balloon carries a simple message… give a hug! In Brazil, it is very common for people to greet each other with a sincere hug, and this is what we want to bring to the world”. The builder of over 380 balloons, this will be Da Silvas first visit to NZ, ticking off one of his ballooning goals in being able to fly here. “I cannot wait to fly and soak up the culture and camaraderie of the Balloons over Waikato festival in Hamilton”. Come and have a hug at Balloons over Waikato Wednesday 22nd – Sunday 26th March 2017, with the Big Hug. 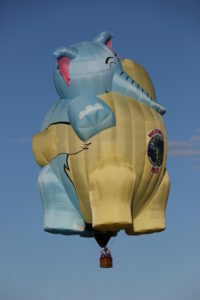 Visit www.balloonsoverwaikato.co.nz for further information and like us on Facebook for the most up to date information.